We may have all heard people saying that maximum money is made in the first few minutes or the last few minutes of trade. 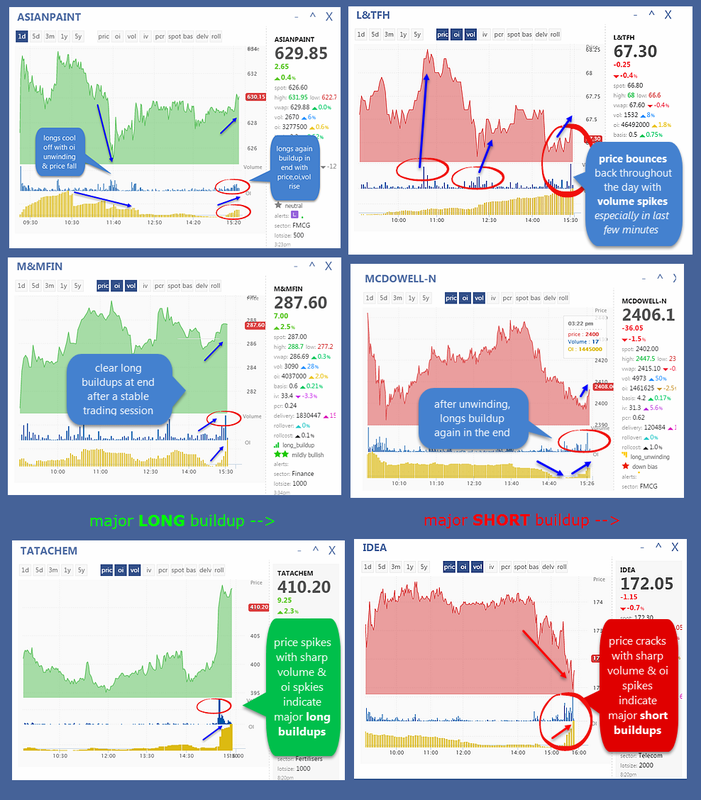 But how to identify such opportunities and scan for this kind of high price/volume/oi action one needs the right tools and the keen insight to read such info. In www.myfno.com we have created one such critical tool that can help you in just this. 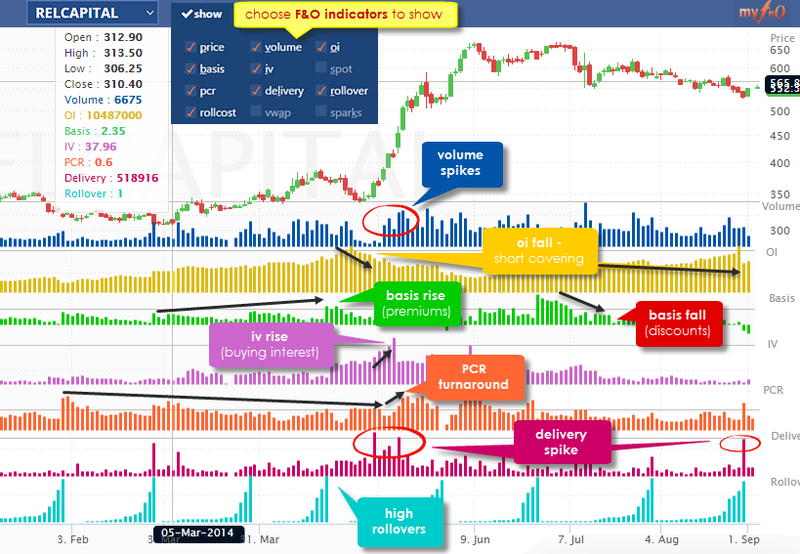 In our app, you can actually see the %CHANGE in price/volume/oi between any custom time frame / interval. So if in the last 15 minutes of trading session, if we set this %chg parameter to say 5 minutes from the interval menu as shown in the pic, then we can precisely see any action happening in just that last X minutes chosen, so any sharp price/volume/oi spikes are visible & can be used as a base to identify the high %chg stocks. I personally like to see the AdvanceDecline screen in myfno.com because besides the %chg, it also groups the stocks sectorwise, so i can see if the whole sector is also where the ‘smart money’ is moving in. or super imposed so that one can take decision of buying/selling of put/ calls. Simlarly yr tips regarding finding btst stocks by studying charts in the last 15 min of trading day when longs are building up with spikes in vol, iv and price rise (as in case of M&M,Tatas hem, Asian paints) what should be the strategy. To buy or sell the option.kindly advise. I am using myfno since the last 4 months and found that features are quite interesting as well as your blog. Could you guide me how i can utilize myfno for intraday trading as i am not able to do so ? Could you design such a easy module for intraday trading? Thanks! Should i also watch for technical in charts segment? Is it possible to generate 3,5, 10, 20, 30, 50, 100, 200 days SMA and EMA in a tabular form by using myFno platform ? I have tried checking with the link of 10min you have provided. However, I am not able to see the %chg in the last 10 min. I am only able to see the whole day’s chg% in price and volume. Is the link you have provided applicable to only a select customers like Gold or Platinum? I am silver package member. Anuraag, brilliant guidance and support, really. today, for SRTRANSFIN, I am seeing 20% in OI, -40% in Volume and .4% in Price, can you please elaborate what this means..